This is truly a once in a lifetime astronomical wonder of the century - the Transit of Venus 2012. It will be visible in Singapore if the sky is clear! Duration: From 6:13 AM in the morning until 12:49 PM in the afternoon (Singapore time). Video simulation of the event as would be seen from Singapore. For best experience, watch it in fullscreen and 720p HD. 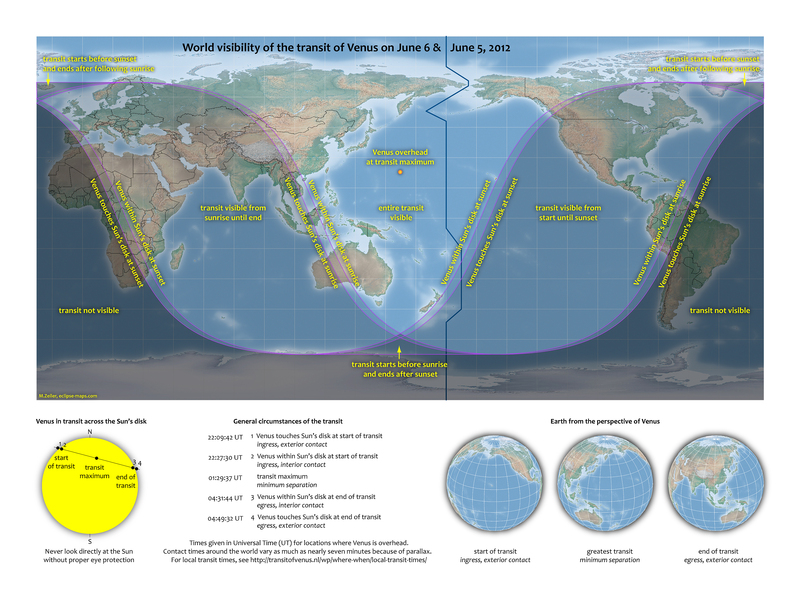 These are the 3 major locations to view this even in Singapore on 6 June 2012. They are all open to public and admission is free! (2) Galaxy Community Club (GCC) - formerly known as Admiralty Gardens Community Centre. If it is still visible in the country you will be at on that day, try to contact the local astronomy club or planetarium beforehand and participate in their events if any. You may want to along some small portable chairs, big umbrellas and water bottle to beat the heat and humidity while travelling to the event venue and while waiting in the queue. Parents please supervise your children at all times and make sure they do not touch any telescope setup. You may wear sunglasses to protect your eyes from the Sun while queuing or travelling to the event venues but NOT for looking directly at the Sun. Only look through telescopes with proper solar filters attached. For solar projection on a paper or cardboard, it is very safe to look at the image projected on them. But make sure you DO NOT put your head (or anything for that matter) BETWEEN the telescope and the paper/cardboard. That will cause permanent eye damage. If you are looking at the Sun only through large piece of solar film (no telescope involved) or paper glasses with solar filters, make sure there are no pin holes in them as the sunlight may get through these holes and damage your eyes. You can look through them at an arm's distance and see if you can spot any before you move you head closer to the solar filter. If you spot any, just let the event organisers or helpers know. Also, if you spot any filters that is shaky or very loosely attached on a telescope, there may be a danger the filter may drop off during observation. Please inform the organisers and helpers too. Having said that, these 3 events are run by extremely experienced and knowledgeable astronomers and the chances of improperly equipped solar telescopes being set up and wrong viewing advise given is almost impossible. They have been working very hard in the past few months to make sure the public will be able to enjoy this event safely. As for myself, I will be joining my astro friends to observe and photography at Bishan Park 2 McDonald's from 6:45 AM onwards. If you happen to be around the area, feel free to come down and take a look and photograph this astronomical wonder. We will be bringing our telescopes, binoculars, solar eclipse paper glasses and DSLR camera lenses properly fitted with certified astronomical solar filters. This place has a great view of the East under the shelter of McDonald's and also one of our favourite location to do free public outreach astronomy (aka sidewalk astronomy) where we bring our telescopes down there so the public can stargaze through them for free. I sincerely hope people will take time off (no matter how short) and make an attempt to observe this with their family and friends and contemplate on the following while doing so. (1) Our lifespan is just extremely short. No human being can even live long enough to see 3 transits of Venus in their lifetime. Should we waste our time on doing meaningless things? (2) We are so curious about how stars far far away in cosmos looked like but forgotten about our very own Star - the Sun. Perhaps we should also spend sometime understanding our Sun as it has a much significant effect on humanity regardless of country borders and race! (3) Look at how humongous the Sun is compared to Venus and thus Earth. There are much bigger things up there and out there. We should not be arrogant and egoistic about whatever little knowledge we know of right now. Keep learning so that we can improve the quality of our lives and help others to improve theirs by volunteering. (4) We are able to enjoy these free astronomical events over the years because because of these sincere event organisers and helpers. They are not doing this for commerical gain. They do not receive huge grants or funds to conduct such events let alone funds to do huge publicity in the main stream media. Have YOU contributed to society by volunteering a little bit of your time and expertise too? (5) Is the Singapore education system or parents too overly focused on subjects that reap the most economic gains at the expense of killing a student's natural inclination to dream, to aspire and be creative problem solvers which Science can instill regardless of whether they will turn out be scientist in the future? We will be using the Twitter hashtag #VenusTransitSG for all the related tweets, especially on the big day. So help us make it trend on that day! In conclusion, let's all pray for clear skies on 6th of June! A day young children may fondly tell their children about and to look out for the next one in 2117!